Congratulations on winning the challenge! Great job! Beautiful photo. Great composition. Love the trees that are starting to grow on that big rock. Congratulations on your challenge win! Thanks for all the kind comments everyone. Sorry for the late response, going to be try and be more active on here. Very peaceful, but colorful and exciting as well. Great shot. Excited to follow your work. How do you achieve such a painting tone to your photos, it’s lovely. Thank you very much. I haven't been on here as much as I'd like so I'm very sorry for the late response. I really appreciate the kind words. Good light is the key. I just try to amplify what's already present. 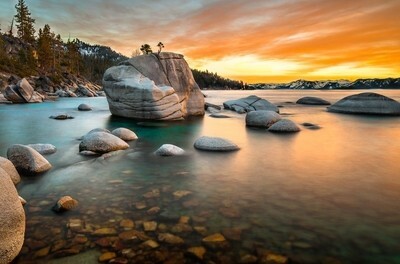 This photo was taken last spring at Lake Tahoe when the water was really low. I used a ND filter to smooth out the water. I would love to answer any questions about the photo. Thanks for looking!